The Dorchester Apartments started out as a rundown, ’60s style complex at 4857 Fauntleroy Way in West Seattle. Tucked on a quiet street near great shopping and restaurants, this twelve unit building needed serious renovation to match its up and coming location. Jim added that the drab colors and closed-off floor plan weren’t conducive to modern city living, in spite of the building’s prime location off the West Seattle bridge. The original kitchen was firmly planted in the past with its off-white color scheme, black grout lines, and dated appliances. 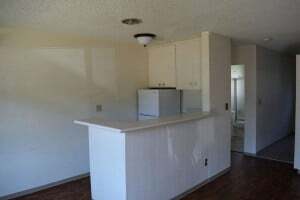 By taking out the high countertops and enclosed U-shape of the original kitchen, each apartment now features an open concept perfect for entertaining guests. The counter provides an easy to clean space for cooking, plus seating for three. A large, single-basin, stainless sink and brand new appliances ensure functionality and style in this refreshed kitchen. 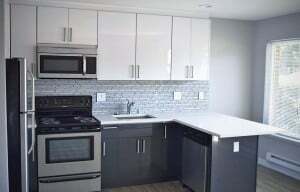 The main focus of this renovation was to provide an open concept kitchen and living room in order to maximize the space in each one-bedroom unit. 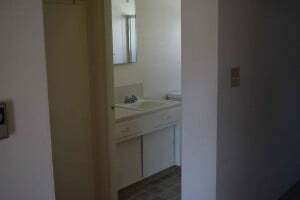 In the bathroom, gray tile replaced the discolored previous flooring. 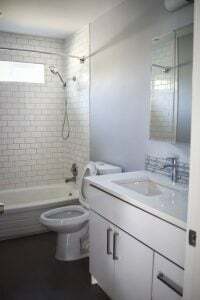 The Jamar team also added white subway tile in the shower to emphasize a clean, chic look. “Diane helped us maximize the space, introducing a larger vanity and counter slab that’s easier to maintain that the original,” said Snelling. 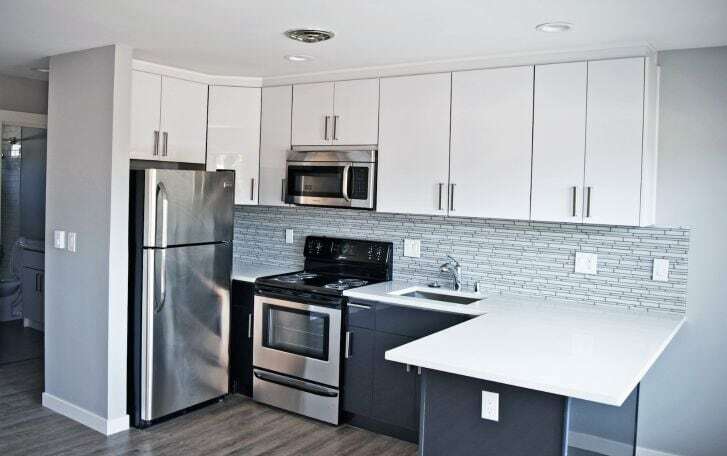 These brand new one-bedroom apartments cater to individuals in the city looking to live in a central location of West Seattle without compromising on major appliances like in-unit washer and dryer. The new, upscale Dorchester speaks to the major audience of Seattle by delivering comfort, functionality, and style in the city. “The level of detail in customer service was so helpful to this project in particular. The Pius team understood our taste and translated our vision for the apartments into a design that met all our needs,” said Snelling. Designers at Pius chose a tasteful backsplash coupled with bold cabinetry and countertops to showcase the kitchen’s sleek, timeless style. Snelling added that his team was able to save time and added cost by taking advantage of Pius’s “one-stop shop” process that took care of everything from cabinets to knobs, appliances, and flooring in one place.